Mary Finsterer is recognised as one of Australia's most original composers. Her work has received considerable international recognition and 'brims with energy, invention and much aural imagination.' (Herbot Culot, 2004). Having completed her Bachelor of Music degree at the University of Melbourne in 1987, Finsterer traveled to Amsterdam to study with Louis Andriessen in 1993 as recipient of the Royal Netherlands Government Award. She then completed a Master of Music degree with Prof. Brenton Broadstock at the University of Melbourne in 1995, and a Doctor of Philosophy degree in 2003. Finsterer has been a lecturer at universities around the world including the University of Montreal (Canada), Dusquene University (Pittsburgh, USA), Den haag Conservatory (The Netherlands), University of Wollongong, Victorian College of the Arts. She has lectured in composition at the Conservatorium of NSW, University of Sydney, since becoming a resident of Sydney in 2003, and at the Australian Film Television and Radio School since 2005. Finsterer's work has received numerous awards including the Albert H. Maggs Award, Alfred S. Bequest, 'Let's Celebrate Oz Music' ABC Award 1989 and Le Nouvel Ensemble Moderne's Forum 91. In 1992 she won the Paris Rostrum Prize and 'Music Lives!' in Pittsburgh. In that same year she was composer in residence with Sydney Symphony Orchestra. 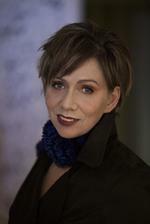 In 1998 she received the Australia Council Composer Fellowship. Mary Finsterer has represented Australia in numerous World Music Days festivals - Zurich 1991, Essen 1995, Manchester 1998 and Zagreb 2005 - and received the prestigious award to compose for Ensemble Intercontemporain and IRCAM in 2001. Other performances of her work have taken place throughout Europe, Canada, USA and Australia by leading ensembles including the Melbourne, Sydney, Queensland, Tasmanian and Western Australia Symphony Orchestras, Australian Chamber Orchestra, Het Trio, Ensemble Modern, Le Nouvel Ensemble Moderne, Pittsburgh New Music Ensemble, Asko Ensemble, Ictus Ensemble and the Arditti String Quartet. In the last few years Finsterer has become increasingly involved in film, composing written scores and electroacoustic soundscapes as part of multimedia events for the Zagreb Biennale in 1999 and 2005; for Le Nouvel Ensemble Moderne performing at the Adelaide Festival and at Strasbourg and Montreal in 2000, for Ensemble Intercontemporain and IRCAM performing at the George Pompidou Centre in Paris 2001, and the acclaimed Ictus Ensemble for performance in Lille and Brussels 2004. In 2006 she received a Churchill Fellowship for her continuing work in multimedia and was made an Honorary Research Fellow at the Australian Film, Television and Radio School in 2009. Since 2007 Finsterer has completed a body of work that includes major orchestral work for the Dutch ensemble ASKO│Schönberg in association with Tura Music, a violin duo for the acclaimed soloists Natsuko Yoshimoto and James Cuddeford, a string quartet for the Goldner Quartet, a chamber work for the Sydney Soloists and a number of works for her composer in residence position at the Campbelltown Performing Arts Centre for 2009. Her orchestral fanfare Afmaeli, was the opening piece for the 70th Birthday celebrations of world-renowned composer Louis Andriessen at the Holland Festival in 2009. In the same year Finsterer was the winner of the Paul Lowin Orchestral Prize for her new work premiered by ASKO│Schönberg in Amsterdam, In Praise of Darkness. Finsterer now divides her time between compositions for the concert stage and the world of film music. South Solitary, written and directed by Shirley Barrett, was Finsterer's first feature film, the music of which has been released on the CD label, ABC Classics / Universal. The score for South Solitary was a finalist in the Film Critics Circle Awards. Mary Finsterer's most recent work, her new opera Biographica, was premiered by Sydney Chamber Opera and Ensemble Offspring at the Sydney Festival in January 2017 with exceptional success. Having enjoyed a sold-out season, it was enthusiastically received by critics and audiences alike and described as 'an outstanding new opera that deserves a permanent place in the repertory'. Biographica received the APRA|AMCOS Art Music Award for Vocal Work of the Year (2018). Finsterer was the composer-in-residence at the Canberra International Music Festival in 2018. When soft voices die : choir and cor anglais (2014) Commissioned by Paul Stanhope, Sydney Chamber Choir. Aerea : large chamber ensemble (2013) Commissioned for Monash Art Ensemble. Lake Ice : (Missed Tales No.1) (2013) Commissioned by Sydney Symphony Orchestra. Silva : percussion concerto (2012) Commissioned by Ensemble Offspring, Claire Edwardes. In praise of darkness : for orchestra with concertante for celesta and harp (2009) Commissioned by ASKO/Schonberg, Tura New Music.